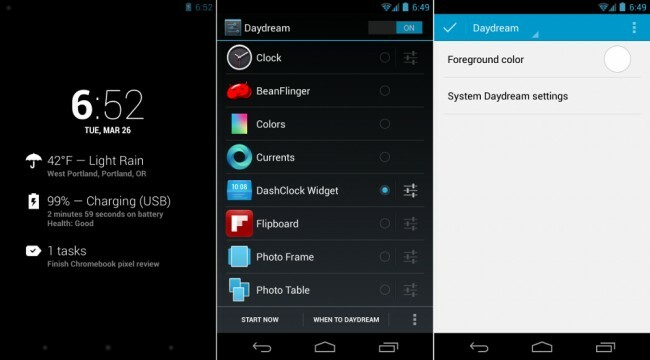 Yesterday, Roman Nurik teased DayDream support that will be included in the next major update of his now-famous Android lock screen app called DashClock. With no time table set for a release, we thought we should point out that you can download the current beta from the app’s code site today and experience all the DashClock-DayDream action you could ever imagine. In this beta, don’t forget that you’ll first need to go into your phone’s Settings>Display>DayDream in order to set DashClock as the DayDream option. From there, you can tap the settings menu button, which then pops up DayDream-DashClock settings in the app. The only option that you can currently tweak, is the color of the text that moves in while DayDreaming. Don’t forget to check out our rolling list of the best DashClock extensions.